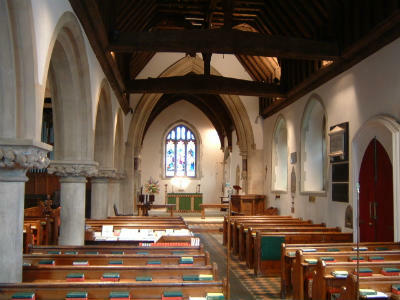 The Chancel is believed to be the oldest part of the Church, its walls those of the original building. The lancet window on the north side, and the piscina, aumbry and priest's door on the south side are all of this period. Almost as old are the remains of an old tomb beneath the lancet, with exquisite carving on the shafts and pinnacles. This possibly represents the last resting place of John Le Bel, a lord of Frensham Beale manor who lived in the early 1300s. In addition to the east window, there was formerly a large square window of Tudor style on the south side. Remains of this are faintly visible on the exterior. All the other windows on both sides of the Church were small. The arch-braced timber roof is of the 19th century; but before this time, was plastered and decorated with the portcullis and pelican. The former was of course the badge of the Tudor monarchs. The pelican in her piety, although a common ecclesiastical decoration, has been considered here to be associated with Bishop Fox, who held the See of Winchester from 1502 to 1528. Possibly the entire Chancel was re-roofed in the early 16th century. The Nave was originally continuous with the Chancel; the arch dividing them, and its supporting buttress having been erected in 1868. At this time also, the beautiful oak tie-beams and crown-posts were discovered beneath the plaster and whitewash of the ceiling. From the south wall, painted arabesques in red, yellow and black were sadly removed with the plaster. The holy-water stoup near the door was also partly destroyed, although sufficient remains to betray its early mediaeval origin. The North Aisle was built in 1827 to meet the needs of the ever-increasing population of the period. The work was carried out under the auspices of the Incorporated Church Building Society at a cost of £345. From some time in the 18th century, there had been a gallery at the west end of the Church, extending into the tower, but further capacity was secured in the new aisle together with an extension of the gallery. It was built by local labour, including the 'unemployed poor', the surveyor in charge, James Harding of Farnham. The whole of the north wall was removed and the roofs of both the nave and the new aisle were supported on wooden pillars. This form of support proved highly precarious and in the succeeding years was once repaired with oak pillars and arches and finally made secure in 1868 by the present rather heavy pillars and arches in Norman style. 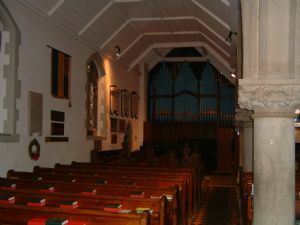 The Vestry was originally sited where the organ now stands, with access only from the Chancel. At the restoration, this area was taken into the body of the Church and a new vestry built on the north side of the new aisle. It was rebuilt, considerably larger, in 1934. The Organ was given by Mrs Esther Combe of Pierrepont in 1871 and enlarged at her expense in 1896. It was restored and again enlarged, using old parts, in 1922. Electrification of the action, and further restoration, was carried out in 1984. From the 18th century, musical accompaniment to the services was by the village band, with both brass and reeded instruments. There then followed a barrel organ, and in 1854, a second-hand harmonium. The Woodwork — most of the carvings were the work of Miss Grace Moultrie, a Frensham resident: the former reredos, now in the east end of the north aisle (1872) and the belfry screen (1875). The pulpit was designed, but apparently not executed, by her. 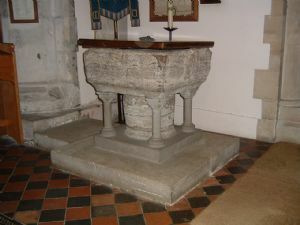 The Font, of early mediaeval period, with carvings nearly obliterated, is made of Purbeck marble. Its basal supports are clearly of recent origin. The Cauldron of beaten copper, is known to have been in the Church for several centuries ... 'from beyond the memory of man'. It was most likely used in the mediaeval period for Church Ales. The Restoration of 1868 brought about a complete alteration of the interior. Although the building was clearly in a dilapidated condition, the original appeal made mention of 'yielding to the spirit of restoration which has prevailed of late years'. The architect was J. M. K. Hahn, the builders Frank Birch, father and son, of Farnham, and the total cost £2152. In addition to the vital strengthening of the roof support, all the windows were altered, with the exception of that on the west; and that on the east, which was completely recut in its original style. The floor was tiled where no timber was laid, replacing the former covering of gravestones. Amongst those was that of Archdeacon Oliver Dynham who died in 1500. Also discovered upside down in the floor at the time was the stone coffin with carved Abbot's cross now resting against the north wall behind the font. The floor of the belfry was set with further old stones most of which were taken from the Chancel. Although their inscriptions are now largely obliterated, there is documentary evidence that they are the memory' to those said to have been buried beneath the floor near the altar: numerous members of the Salmon-Bishop family, our patrons in the 17th and 18th centuries, a church-warden. George Coldham, 1691 and a Curate's young wife, Lucy Bridger 1763.